Image used under Flickr Creative Commons license from Troy B. Thompson. The word icon seems to be trending lately: pop icon, fashion icon, sports icon and more. Though only 55 years old, Alaska as a state has its fair share of icons. In the spirit of the holidays, let us introduce you to some our favorite icons that take center stage this time of year. Immersed in Christmas spirit, North Pole, Alaska, is just a 20-minute drive north of Fairbanks Princess Riverside Lodge. There stands a 42-foot-tall Santa Claus statue. Giant Santa ends up in thousands of photos taken each year by visitors and locals alike. Built in 1968 by Wes Stanley, the world’s largest Santa watches over visitors as they come and go from the Santa Claus House in North Pole. Stars are another iconic winter symbol, and in Alaska they come in all shapes and sizes. For example, Alaska’s blue and yellow flag features small yellow stars aligned to symbolize the Big Dipper, which is a glorious sight on a clear night’s sky. Around the holidays in Anchorage, another very large star appears. In a tradition that dates back several decades, 360 bulbs arranged in the shape of a star light up the cold winter sky on Mount Gordon Lyon in the Chugach Mountains east of Anchorage. The star is lit the day after Thanksgiving and stays up until after the Iditarod in late March. Many people in Anchorage grew up with this star as a fixture, and we love it for so many reasons, including the warm holiday welcome it offers travelers flying into the Last Frontier. Since we’re on the topic of stars, let’s not forget one other iconic Star – Alaska’s favorite (nonfictional) reindeer! 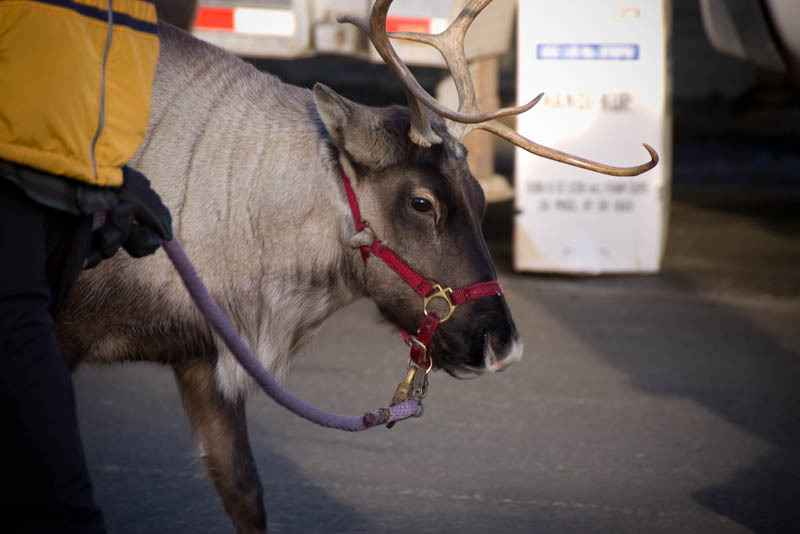 Living at the corner of 10th Avenue and I Street in downtown Anchorage, Star the reindeer flaunts her chocolate-colored coat as she wanders up and down the sidewalks of 9th Avenue. A celebrity of a different breed, Star pushes through the crowds at special events with her antlers that span more than two feet, and she’s is always the center of attention. The scent of spruce trees is another holiday symbol we find quite iconic this time of year. It is legal to cut down small trees to use as Christmas trees in many areas around the state, as long as you follow certain stipulations. Tree cutting is permitted starting Thanksgiving Day as many head out in search of the perfect shrub for their living room. The Kenai Peninsula is one of the more popular areas for families who often make a fun day trip out of the affair! These are just some of the notable and lasting Alaska holiday icons, but there’s always room for more. As we look toward a new year, we look forward to the new traditions and icons it will create along the way. Happy holidays from all of us at Princess Lodges!